As the Bills prepare to play Bill Belichick and the Patriots Sunday, they’re hoping that the New England coach may be looking ahead to Christmas. 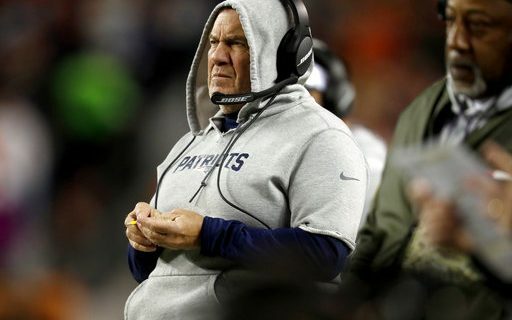 Sports comedian Jeff Wozer found some signs that the Hoodie is caught up in the Holiday. • Makes annual visit to Gillette Stadium’s Lost & Found to look for gifts for his kids. • For home Christmas lights parks car in driveway and turns the hazard lights on. • Allows Tom Brady to keep a framed 5 x 7 photo of his trainer on sideline Gatorade table. • Places restraining orders on ghosts of Christmas Past, Present, and Yet to Come. • Hands out embroidered handkerchiefs made from hoody sleeves. • After Christmas Eve game with Bills plans on sending the Patriot’s ball boy to the poulterer down the street to buy the prized turkey in the window and deliver it, unanimously, to Roger Goodell. • Replaces home’s missing Nativity scene figures with army men making it look as if Joseph and Mary are under house arrest. • Adorns each locker stall in referees locker room with an Elf on the Shelf. • Liquored on eggnog, drives around Foxboro with Robert Kraft laughing maniacally knocking down neighborhood snowmen. For more from Jeff, visit his author’s section at Buffalo Sports Page.